We’re getting there with TRIPanswers and hope to have something by September, a slight delay, but that seems traditional. I’ve said very little about TRIP answers but will give a bit more detail here and over the next few weeks. 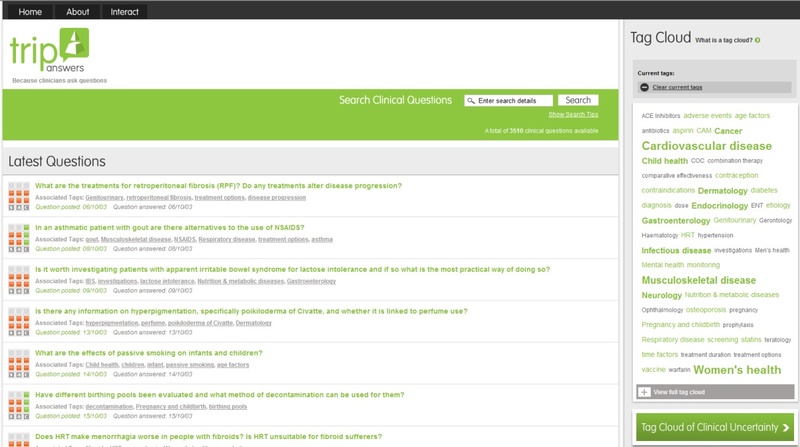 In a nutshell TRIPanswers is a repository of clinical Q&As. We hope our efforts will see a long-term dream of mine realised – a space on the internet where clinicians/information specialists can freely share their Q&As with others. With that aim in mind we will launch with 8 Q&A services around the globe, all willing to share their Q&As. A list of most recently added Q&As. To the left of each Q&A is a multicoloured cube with the letters s, a & c underneath. This represents the quality score that each Q&A receives: s = search, a = appraisal and c = confidence. Tag cloud. Each question is tagged and these aggregate to form a tag cloud. This can work independently, to allow browsing of the repository. However, it can also work with the search, to easily narrow down to the users area of interest. Tag Cloud of Clinical Uncertainty. A personal favourite, this is a sub-section of the site, specifically for questions where the evidence is poor. This links in from my work with DUETs but is different in two main ways. Firstly, it does not restrict entries to therapies. Secondly, the entry point (uncertainty) is more pragmatic. But the aim is pretty much the same – highlight areas where the research evidence is poor. Another key aim of the site is to encourage interaction and user participation. We have made it easy for users to leave comments on each Q&A and we believe this can only improve the quality of each Q&A. In summary, I would say that TRIPanswers is a repository of Q&As which aims to interact with users to boost and improve the content still further.